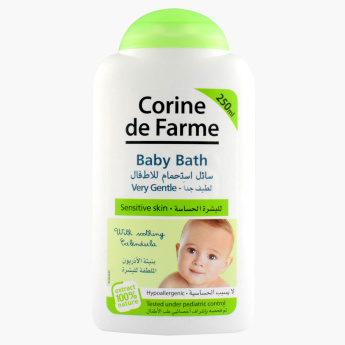 Corine de Farme Baby Bath - 250 ml | Multicolour | Gentle foaming formula ideal for a real moment of tenderness with your baby. Enriched with natural ingredients, this baby bath is alcohol-free and dermatologically tested. This baby bath gently cleanses your little one's skin leaves it soft and fresh. Feature 1 : Gentle foaming formula ideal for a real moment of tenderness with your baby. Feature 3 : Alcohol free. Dermatologically tested. Hypoallergenic. Feature 2 : Leaves the baby's skin soft and fresh.